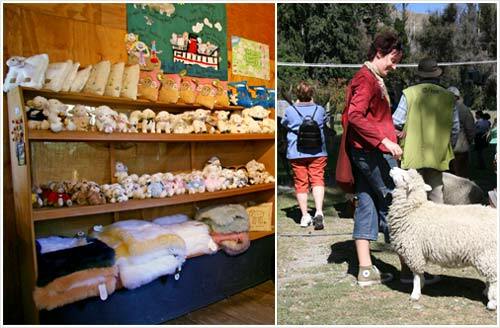 Shelves of sheep paraphernalia (left) are on sale to tourists at Walter Peak Station, on the shores of Lake Wakatipu, near Queenstown. Visitors to the station can also have a close encounter with a sheep (right). Internationally New Zealand is known for its high numbers of sheep, and its economy based on sheep farming. Tourists are often keen to visit farms where they can see farm dogs mustering sheep and buy sheepskin rugs or other sheep-related products.